It is just days until we learn what book takes home the coveted Sibert Award, but today is the day here on Kid Lit Frenzy and over on Unleashing Readers where we find out who won our Mock Sibert Award!!! What a phenomenal choice! Now we just have to wait until Monday to find out if the Sibert committee agrees. We are also happy to announce our giveaway winner. 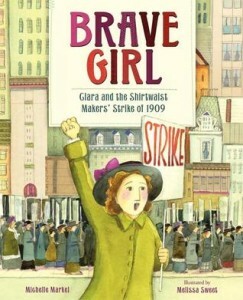 Congratulations to LYNNE EICHEL who chose Brave Girl as her prize. I had such a blast hosting the Mock Sibert with Kellee at Unleashing Readers! Thank you to all who participated and cannot wait to see who wins on Monday! In "2014 Mock Sibert", "Unleashing Readers"